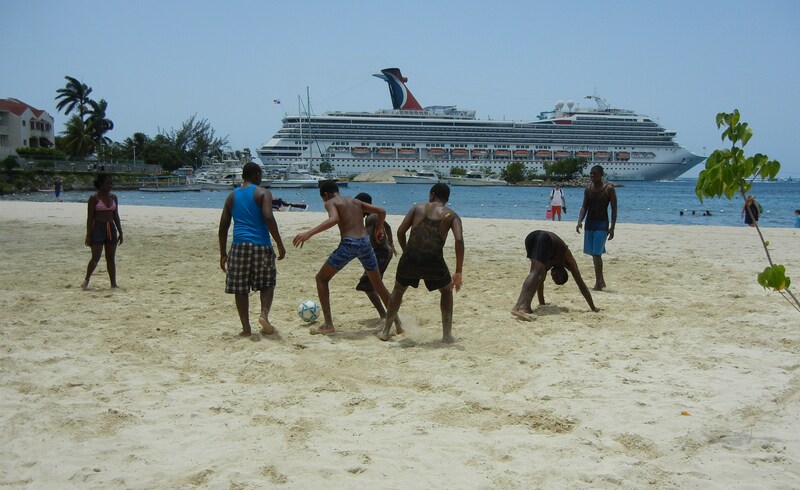 It’s summer time here in Jam Rock and Papine High School came out full blast. Papine High School’s Summer Programme is being held to promote self-esteem, social skills, and intelligence among other things. This keeps students engaged, instead of may be sitting home doing nothing…unable to socialize with their usual friends from school and not able to meet new friends. 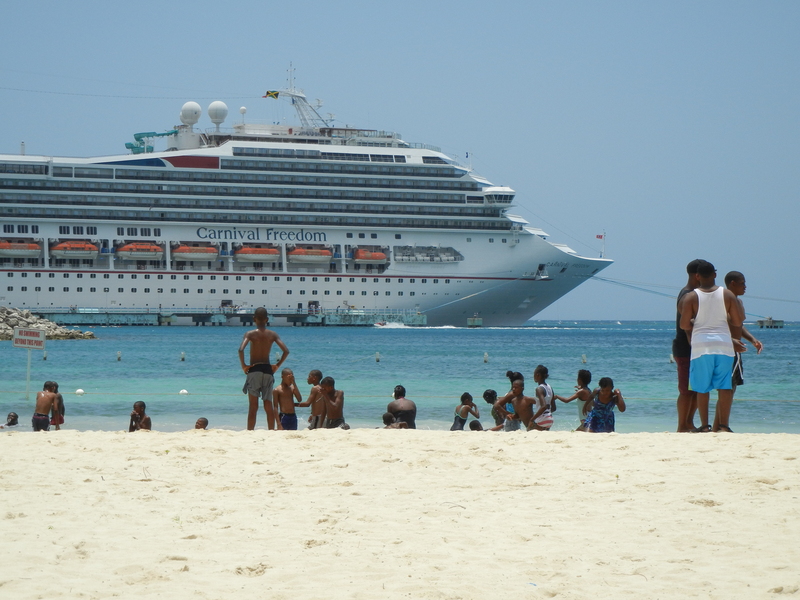 Therefore a mixture of different grade levels was at Ocho Rios Beach, chaperoned by Ms. Thompson, Mr. Brown, and other teachers. 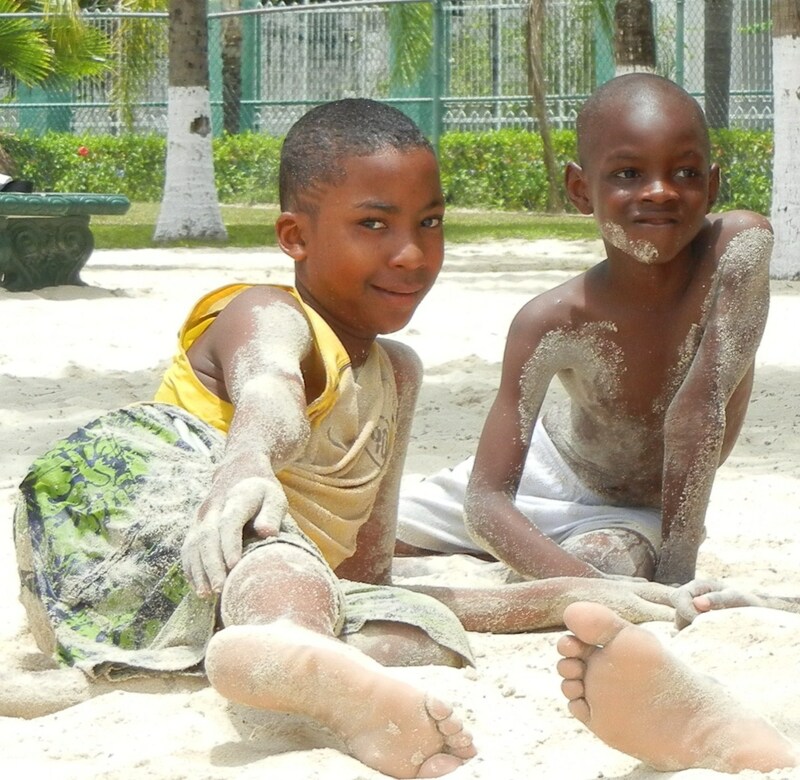 The students enjoyed a day filled with games, such as soccer, rolling in the sand, racing into the water, laughing, and just having fun…a break from school. The teachers were very strict, particularly Ms. Thompson, she protected her students…like us Jamaicans love to say…“Motha Hen”. It simply means no one takes pictures without her permission, rightfully so. She was the referee and player of a soccer match. What I loved about Ms. Thompson was that she incorporated Jamaican Patios into her communication with her students, as well as English. I wish I had more of that in high school. 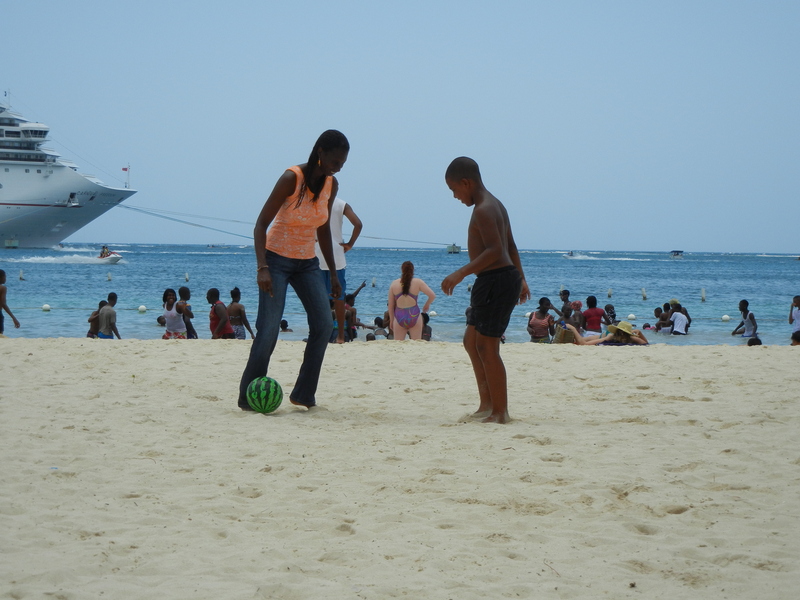 Also, she had girls playing soccer alongside the boys. I told her how pleased I was to see this and was told, “They are the ones playing it now”. This means more and more girls are now choosing soccer as a sport here in Jamaica, as opposed to the traditional netball or track and field sports. Papine High was once hockey champs, so not only can Ms. Thompson play soccer, she plays netball, basketball, and hockey…pretty darn great. I enjoyed talking to Ms. Thompson. I got a closer look into Jamaican education and found out, now I can put aside my concerns. Concerns I had about the Jamaican school system, which may not be completely what it used to be…like back when I was a child. Well I am happy to say Papine High students were very respectful and always answered me “yes Miss” or “no Miss”. Well done Papine High School. 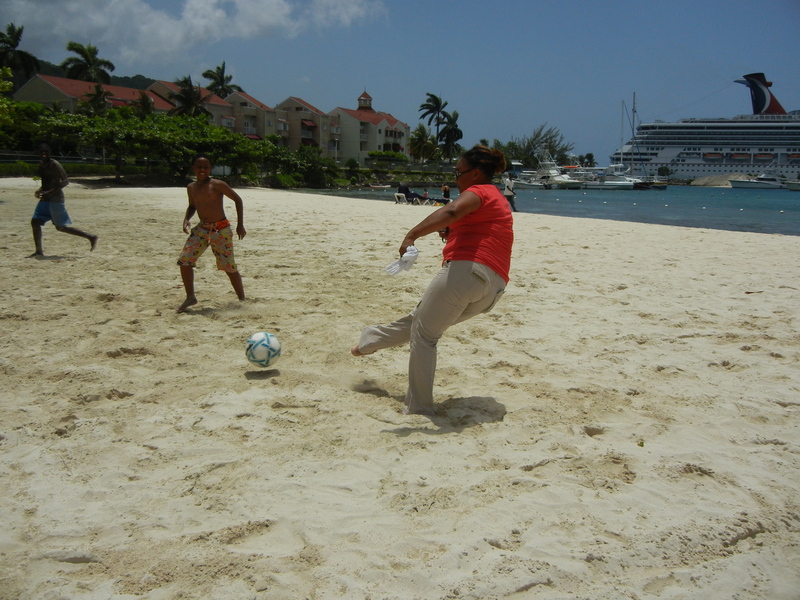 A teacher playing soccer with a student. Ms. Thompson playing soccer with her students. This entry was posted in Big Wonders In Jamaica, Kingston, Schools and tagged education, Jamaica, Kingston, Papine High School, summer break. Bookmark the permalink. I lived very close to this school..small world. yes it is! I ran into so many folks who either know my Dad or entire family…he he heeee. It can be a good thing…sometimes 😉 Thanks for stopping by. I wonder how long ago was that lol ;). Thank you for the comment. It’s funny I did not know that, thank you.